Major smartphone makers unveil foldable smartphones, signaling the beginning of a new hardware war. Foldable smartphones backed by technological innovations and 5G to stimulate replacement demand from 2020. We recommend adding related parts and materials suppliers to positions as they stand to benefit long term. 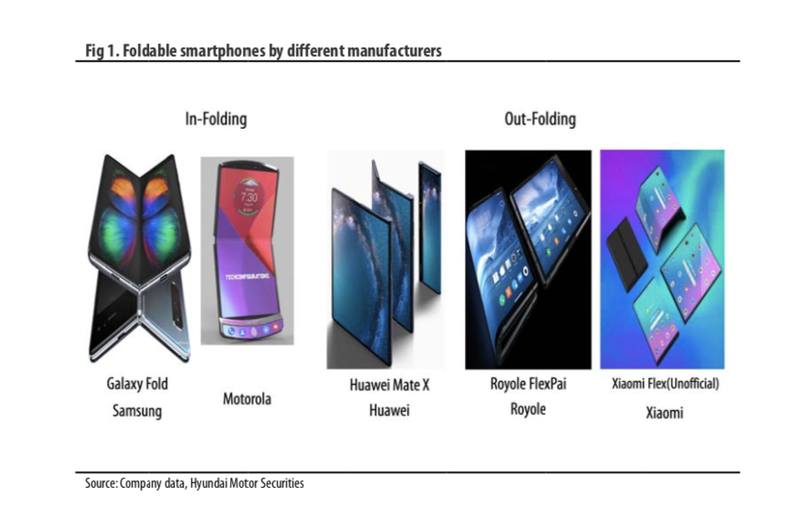 Following Samsung Electronics (OTC:SSNLF), Huawei has unveiled its foldable smartphone while Xiaomi (OTCPK:XIACF) and Motorola (majority owner Lenovo (OTCPK:LNVGY)) also released videos of their upcoming new foldable smartphones. This is providing fresh momentum to the smartphone market where the saturation of demand has led to a longer replacement cycle. Led by Samsung and Chinese names, the bezel-less display and a camera hole on the front display are becoming the mainstream, and bezel-less smartphones with in-display fingerprint scanner means multiple hardware innovations are underway in the smartphone sector. As the world witnesses the beginning of 5G services, telcos’ smartphone subsidies are likely to increase further. Even if the smartphone market posts negative growth in 2019, conditions are ripe for the market to return to the growth trajectory in 2020. In the foldable smartphone space, Samsung’s Galaxy Fold is the undisputed leader. Its hinge, developed by a Korean parts supplier, is able to fold at least 200,000 times, which far distances its Chinese competitors technologically. Samsung’s in-folding smartphones follow the hinge mechanism and have a small gap at the hinge end, but it is not serious enough to hamper the user experience. We believe future technological innovations will allow companies to roll out thinner displays and hinges. Samsung Galaxy Fold’s hinge is the culmination of metalwork efforts, including metal injection molding (MIM), die-casting, and press. As such, the technology has a high entry barrier. The out-folding smartphones released by Chinese players have simpler hinge mechanisms and while they are thinner than in-folding smartphones, they are more vulnerable to external shock and less durable because the displays are outwardly exposed. The in-folding technology is significant because it will make display size expansion easier by allowing smartphones to fold more than twice. Meanwhile, Samsung has only unveiled in-folding smartphones but some of its new models in 2020 may be out- folding smartphones. Samsung targets to sell 1mn units of the Galaxy Fold this year whereas Huawei targets 500K in sales volume. It is uncertain when Apple (AAPL) will release foldable smartphones. At present, the cover window of in-folding and out-folding smartphones is made of colorless polyimide film (CPI). Going forward, out-folding smartphones may adopt ultra-thin glass (UTG), which is believed to be developed by Schott and Corning (GLW). UTG has greater hardness vs. CPI so it is more scratch resistant but it cannot be used for in-folding smartphones because it does not curve well. Meanwhile, the Galaxy S10 is now bezel-less and has a front-facing hole-punch camera. Going forward, we expect smartphone makers to attempt to eliminate the camera hole as well. Xiaomi adopted a pop-up camera design for its Mi Mix3. In the future, we believe there will be attempts to develop a pop-up design based on a hinge mechanism, and smartphones will be completely bezel-less. We think the smartphone replacement cycle will be shortened on the back of 5G services and hardware innovations such as: 1) foldable smartphones; 2) bezel-less full-screen smartphones; and 3) bezel-less smartphones with an in-display fingerprint sensor. 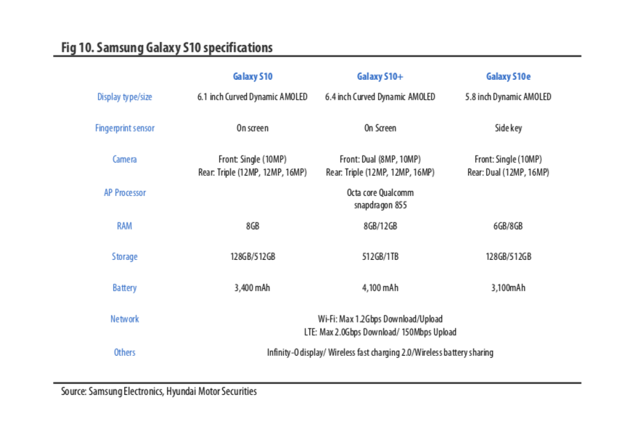 We continue to have a positive view toward Samsung for it is leading technological innovations. We also believe materials and parts suppliers such as SKC Kolon PI, Innox Advanced Materials, and KH Vatec stand to benefit long term. Additional disclosure: Hyundai Motor Company is a passive shareholder in our bank.